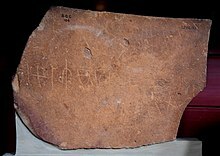 Safaitic is a variety of the South Semitic script used by the nomads of the basalt desert of southern Syria and northern Jordan, the so-called Ḥarrah, to carve rock inscriptions in various dialects of Old Arabic. The Safaitic script is a member of the Ancient North Arabian (ANA) sub-grouping of the South Semitic script family, the genetic unity of which has yet to be demonstrated. Safaitic inscriptions are named after the area where they were first discovered in 1857: As-Safa, a region of basalt desert to the southeast of Damascus, Syria. Since then they have been found over a wide area including south Syria, eastern Jordan and northwestern Saudi Arabia. Isolated examples occur further afield in places such as Palmyra in Syria, in Lebanon, in Wadi Hauran in western Iraq, and in Ha'il in north central Saudi Arabia. The largest concentration appears to be in the Harrat al-Shamah, a black basalt desert, stretching south and east from Jabal al-Druze through Jordan and into Saudi Arabia. Approximately 30,000 inscriptions have been recorded, although doubtless many hundreds of thousands more remain undiscovered due to the remoteness and inhospitable nature of the terrain in which they are found. Typically the inscriptions are found on the rocks and boulders of the desert scatter, or on the stones of cairns. In many cases it is unclear whether the inscriptions on the cairns pre- or post-date the construction of the cairns. The Safaitic alphabet comprises 28 letters. Several abecedaries (lists of the alphabet) are known, but all are written in different orders, giving strength to the suggestion that the script was casually learned rather than taught systematically. The Safaitic script exhibits considerable variability in letter shapes and writing styles. The inscriptions can be written in nearly any direction and there are no word dividers. There are two primary variants of the script: normal and square. The normal variant exhibits a large degree of variation, depending on the hand of individual authors and writing instrument. The square script appears to be a deliberate stylistic variant, making use of more angular forms of the letters. Inscriptions rarely employ the square variants consistently, but mix these shapes with normal letter forms. Finally, a minority of inscriptions exhibit a mix of Safaitic and Hismaic letter shapes. The linguistic classification of the dialects expressed by the Safaitic script continues to be debated. The traditional view held that because the Safaitic inscriptions often make use of the definite article ha-, in contrast to Classical Arabic 'al, that their language should not be regarded as Arabic proper, but rather as Ancient North Arabian. However, as more inscriptions have come to light, it is clear that the Safaitic dialects make use of a variety of definite article forms, including 'al, and even a simple 'a-. Based on this fact, the competing view holds that the dialects attested in the Safaitic script represent a linguistic continuum, on which Classical Arabic and other older forms of the language lie. Most Safaitic inscriptions are graffiti that reflect the current concerns of the author: the availability of grazing for his camel herd, mourning the discovery of another inscription by a person who has since died, or simply listing his genealogy and stating that he made the inscription. Others comment on raids and pray for booty, or mention religious practices. A few inscriptions by female authors are known. Inscriptions are sometimes accompanied by rock art, showing hunting or battle scenes, camels and horses and their riders, bedouin camp scenes, or occasional female figures. Apart from the inscriptions and images left behind, very little is known of the material culture of the Safaitic people. Several factors play a part: the Bedouin of necessity have few belongings and a transient lifestyle and so relatively little will have been preserved in the archaeological record; the conditions for successful preservation are not good, and little research and very few excavations have been undertaken concerning this aspect of Safaitic life. al-Jallad, Ahmad (2015). An Outline of the Grammar of the Safaitic Inscriptions. BRILL. ISBN 90-04-28929-1. ^ a b c Al-Jallad, Ahmad. An Outline of the Grammar of the Safaitic Inscriptions. Brill. pp. 1–22. doi:10.1163/9789004289826_002. ^ Hammarström, Harald; Forkel, Robert; Haspelmath, Martin, eds. (2017). "Safaitic". Glottolog 3.0. Jena, Germany: Max Planck Institute for the Science of Human History. ^ Macdonald, Michael C.A. (2000). "Reflections on the linguistic map of pre-Islamic Arabia". Arabian Archaeology and Epigraphy.